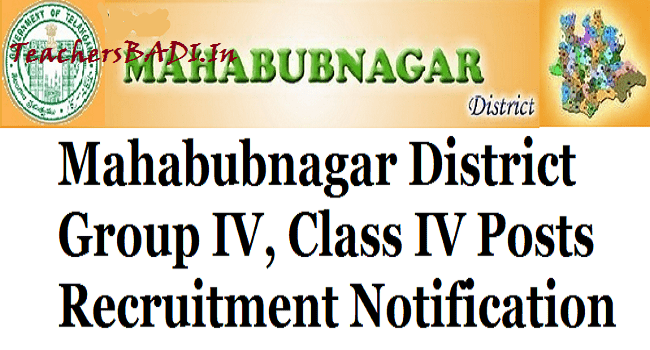 Mahabubnagar Group IV, Class IV/Non Group Posts Recruitment 2017 Notification, Clerk Posts Recruitment, Clerical Cadre Posts Recruitment 2017 : Government of Telangana State, Office of the Collector, Mahabubnagar District has issued Physically Handicapped Group IV and Non Group IV Backlog posts Notification on 31st March, 2017 earmarked for Physically Handicapped in various department in Mahabubnagar District. For the Physically Handicapped Group - IV posts and Non Group IV posts appointment: applications are invited from the eligible Candidates through online mode from Mahabubnagar District web portal from 10-04-2017 to 20-04-2017 . With necessary proof of documents in the annexure as given below. Qualification: 7th Class/ 10th Class/ Degree with Typing Knowledge/ Able to Read and Write. *03. Sweeper: 01; 5th Class pass. 10th pass and 18 months ANM training.